Description You are the outlaw who has to escape from the police, this will be though but possible. Fight yourself to the finish and do not get caught. How much chaos can you cause before they hit you? During your trip you can collect health armor and new weapons. Use them wisely! You score points by destroying the enemy. This retro pixel game is fun for everyone and reminds you of the good old days. 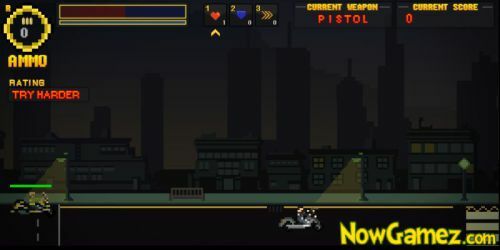 Controls Mouse to aim and left click to shoot. A + D - Move left and right. Space - drops current weapon and uses pistol which has unlimited ammo.